In a school or home setting, a positive learning environment is crucial for a child. A positive learning environment not only consists of the physical setting, but it also encompasses how the child feels or responds to the setting. There are a number of ways families and educators can create an environment for children that is conducive to learning. Create order and remove clutter. 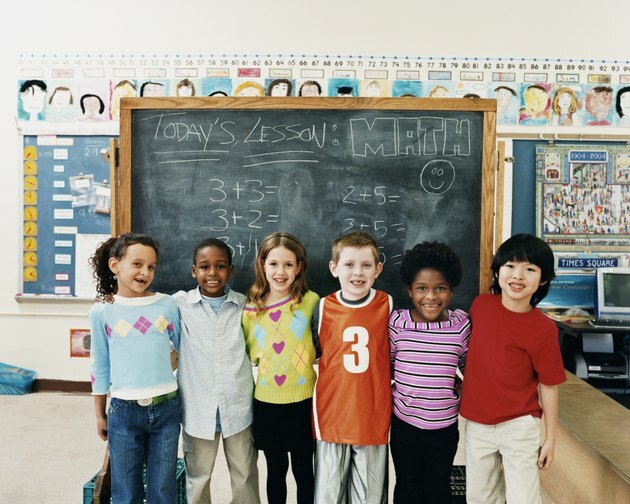 Children need to feel that there is orderliness in their environment so that they can learn. A room that is free of clutter will help them open their minds to new things. A cluttered or unorganized room can be distracting and impede learning. Furniture should be arranged in such a way that there is little traffic throughout the day and so that it appears organized. Ensure comfort. This includes temperature of the room, comfortable furniture and aesthetic appeal. Making sure that rooms are not too hot or cold, lighted appropriately and decorated with items that may be appealing to children can help promote a positive learning experience. Ensure health and safety. Health and safety should be basic concerns for those creating a learning environment for children. This means childproofing rooms, removing health hazards and environmental allergens as much as possible. Children who do not feel safe have more difficulty learning. Bullying should not be tolerated; children should feel safe and valued at all times. Include children in the creation of their environment. This includes having their artwork or accomplishments posted on walls. This will help make their environment welcoming and comfortable. Provide support, praise and feedback. It is important for parents and educators to provide positive reinforcement and feedback to their young learners. This gives children motivation to learn, make mistakes and accomplish new things. Provide discipline when necessary. Establishing rules for conduct during learning and playtime activities is important. These rules should also outline consequences. Behaviors that disrupt learning can disrupt the entire classroom. What Should a Child Know Before Starting Pre-K?